As a bicycle builder, I'm always looking for ways to make something unique. Most recently, I am assembling a relatively vanilla daily cruiser, I wanted to give it a little flair, so I was inspired by the Night Bike Instructable by Adobi which uses glow-in-the-dark paint to literally glow in the dark. I started by purchasing the Glow Inc. Water-Based Glow in the Dark Paint Sample Pack to test what I'd need to do and how well it would work over different surfaces. It comes with one sample each of Glow Inc.'s "White", "Ultra Green V10", "Ultra Blue", "Pure Blue", and "Purple". Glow Inc. claims "glow times" of 24+ hours for Ultra Green V10, 9 hours for Ultra Blue, 2 hours for White, 3 hours for Pure Blue, and 30 minutes for Purple. I had some EMT conduit lying around so I put on a coat of gray primer and did some tests. On the first, I painted the glow colors in one coat over the gray primer. Since I heard the glow was sensitive to UV, I was curious if clear acrylic would affect charging, so one set was left open and the other covered in two coats of Krylon Clear Gloss Protective Spray Coating . On the second pipe, I painted over the primer with a stripe of cheap black gloss, a strip of clear purple (which didn't show much clearness over the primer), and a strip of bright yellow. On each of the colored stripes, I applied one coat of each color in the sample pack. On the last piece of pipe, I painted a portion with the gloss black then went over most of the plain primer and black with Rust-Oleum 214944 Reflective 10-Ounce Spray, Reflective to see if it would work better than plain. This time I only applied the "Ultra Green" in one, two, and four coats, and one coat on the plain primer for comparison. I didn't note a specific need for how long to leave the paint exposed to light so I put them in hazy sun for an hour then brought them in. My initial reaction was that the glow was not particularly bright, although the full containers glowed considerably brighter than a glow-in-the-dark T-shirt I have. On the topmost pipe, darker under-colors indeed appear darker although purple-over-purple seems to work well (I expect that an undercoat of a matching color would work). 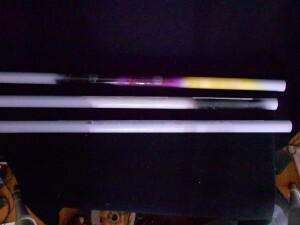 In the middle pipe, the four-coat paint is brighter than the two coat which is brighter than one coat. Reflective spray yielded virtually no improvement. 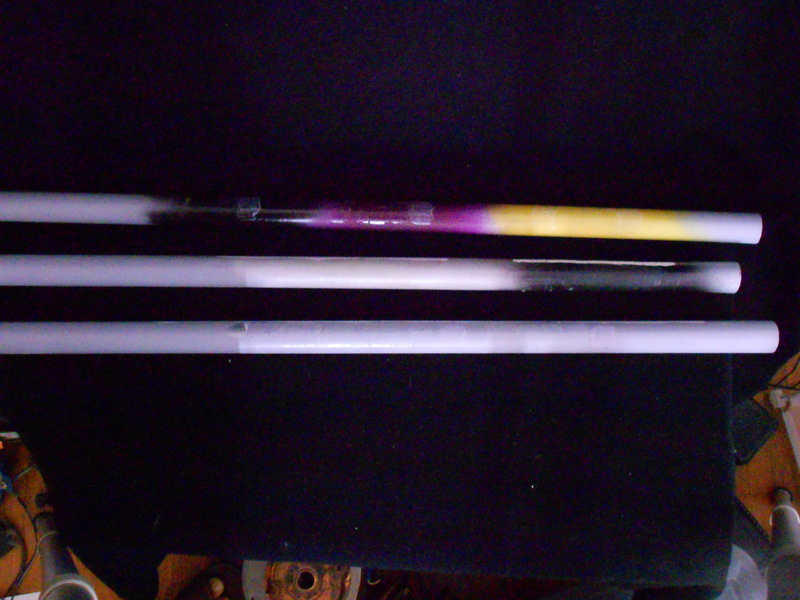 On the bottom pipe, the clear coating (on the right) did not affect the glow at all. 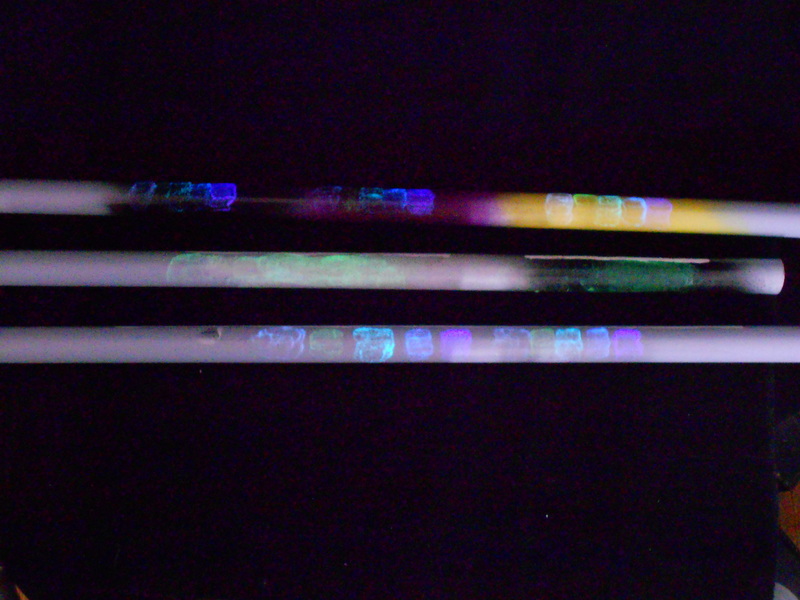 Glow Inc. water-based glow paint samples, freshly charged, photographed in a darkened room (ISO 1600, 1 second exposure, f4.2 on a Nikon Coolpix S3100). 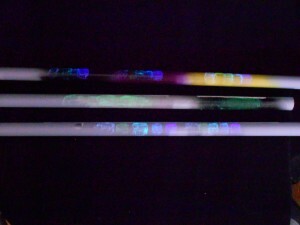 Glow Inc. water-based glow paint samples, 30 minutes after charging, photographed in a darkened room (ISO 1600, 1 second exposure, f3.9 on a Nikon Coolpix S3100). As you can see, the paint is not glowing at all. Needless to say, I'm extremely disappointed in Glow Inc.'s products and would not recommend them to anyone. I do not know how Adobi achieved jeir results in the Night Bike Instructable, but one commenter did ask why the hour-by-hour series of pictures were only taken minutes apart according to the EXIF data embedded in the images. Alas, my bike project will need to have some other way to make it unique.